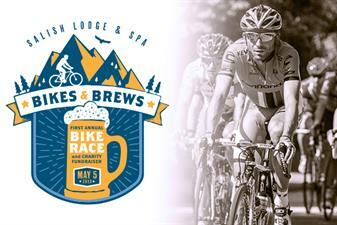 Sign up for the First Annual Salish Lodge & Spa Bikes and Brews Race for Charity! Join us for a fun and fast cycling race for a great cause. Conquer the Snoqualmie Parkway incline as you compete against other cyclists to get from the bottom of the Parkway to the old IGA parking lot! Then you leisurely make your way back down to Salish Lodge & Spa and enjoy some brews from No Boat Brewery, margaritas and some Mexican inspired fare as you peruse items for a Silent Auction. Your registration includes entry into the race, a tee-shirt & swag sponsored by sponsored by our local real estate professional, Homes by Katie Stephens, Windermere Real Estate, and entry into the after party and silent auction. Awards will be given to the top three finishers. Shirts are guaranteed for all PRE-REGISTERED cyclists. You must be present to receive your shirt. All proceeds from this event will be donated to Encompass.